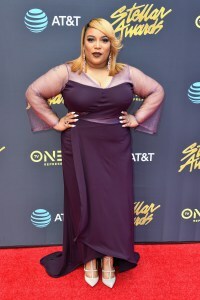 During the 32nd annual Stellar awards in Las Vegas, Tasha Page Lockhart stopped by to talk with uGospel.com about her debut book “And The Winner Is – Tasha Page Lockhart Uncut”. Available now on Amazon.com. Lockhart received a national recording contract with Kirk Franklin and became the first female artist signed to Fo Yo Soul Recordings/ RCA Records. In 2014 Franklin released Tasha’s debut album “Here Right Now” featuring the hit singles “Different” and “Faith Come Alive”. Since the release of her album Tasha has remained a force in the music industry with electrifying performances on BET’s Celebration of Gospel, Bobby Jones, 106 & Park, TV One, The Stellar Awards and countless other TV outlets. To support the release of the album, Tasha has toured House of Blues/Live Nation and McDonald’s Inspiration Celebration Gospel Tour. In March of 2015 Tasha was awarded the Stellar Award for New Artist of The Year. She also won Female Vocalist of the Year in the UK for the Gospel Music Touch Awards. Tasha has maintained the momentum most recently starring in Tyler Perry’s “Madea on the Run.” More recently Tasha has released her no holes barred book “And the Winner is…” Tasha is gearing up for her highly anticipated sophomore release aptly titled “Sophomore” due this summer. Tasha is a certified Life Coach and Founder of HartFelt Coaching Services. She is dedicated to helping others on their road to recovery and providing them with skills to live a healthier life.